Memberships renew every month on the same day of the month of your initial sign-up. You may cancel your membership at any time by giving us 7 days notice of your next billing date with no cancellation fee. No partial refunds will be available. When a member signs up one of our trained staff members will install a RFID chip inside of your vehicle. This tag will be automatically scanned every time you come to the car wash similar to EZ-Pass. Members will be allowed to upgrade their package at any time. Members will also be allowed to upgrade any wash and pay the difference at the time of each wash. Membership is per vehicle and can only be used for one vehicle. No house accounts will be allowed to participate. Members will waive their right to withhold or delay payment when enrolling in the Unlimited Monthly Plan. Ridgewood Auto Wash has the right to cancel any plan that is part of this program. 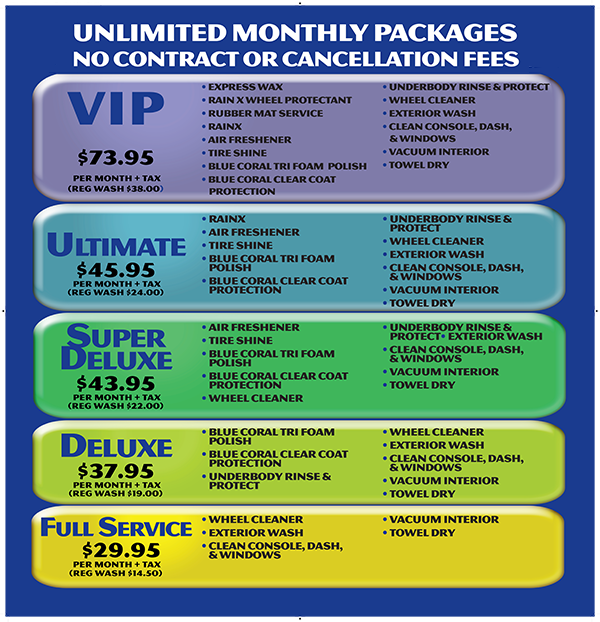 Please email info@ridgewoodautowash.com with any questions or concerns.